TOKYO -- A Hello Kitty-themed "shinkansen" bullet train has debuted in Japan. Adorned with the cartoon icon inside and out, it's a dream ride for fans of the internationally popular character. 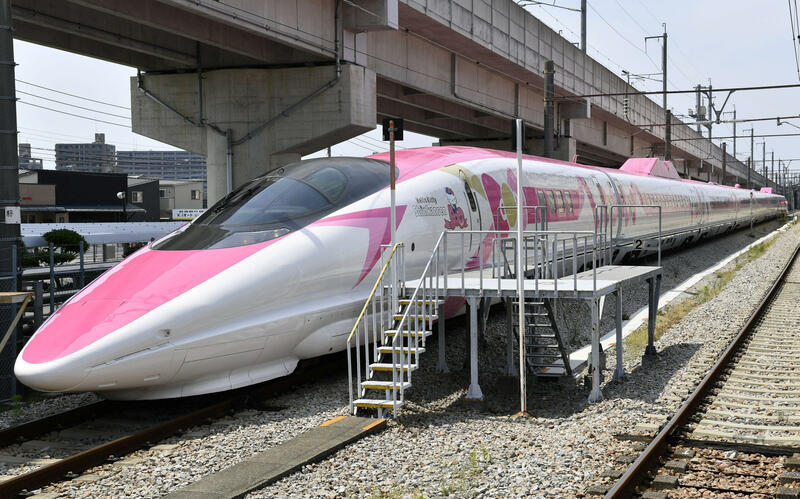 The stylish, eight-car train is painted pink and white, showcasing Hello Kitty images and trademark ribbons from flooring to seat covers and windows. In one car, a life-size Hello Kitty doll donning a train crew uniform and a hat -- decorated with a pink bow, of course -- greets passengers, offering a chance for selfies. Hello Kitty, created in 1974 by the Japanese company Sanrio Co., is a global icon with fans of all ages. After more than 40 years in the market, the round-faced feline with no mouth is still seen everywhere, on stationery and towels to jewelry and even furniture. The aim is to revitalize regional communities in western Japan, the West Japan Railway said. And the country's tourism industry is also looking for a boost from the world famous cartoon character, which has spread around the globe since its creation.